Ⅰ.Statistical Yearbook of Hubei 2017 is an information-intensive data referencebook.Through a large amount of data,comprehensive analysis,records and reflects theHubei province 2016 economy,society,science and technology,culture and other as-pects of development.With a large amount of information,authoritative,wide applicabil-ity and so on. Ⅱ.The Yearbook includes comprehensive,population,practitioners and staff sala-ries,fixed assets investment,energy production and consumption,price index,the life ofpeople and natural resources and the environment,city situation,agriculture,industry,construction,transportation,post and telecommunications,domestic trade,foreign econ-omy and tourism,finance and banking,education,science and culture,sports,publichealth,social welfare,Hubei Province Development Zone of main economic norms,Wu-han city circle,ecological cultural tourism circle of Western Hubei,Yangtze River Eco-nomic Zone,county profiles,Appendix 24 departments,city of part of the Department ofcity information,not including the city administer county. 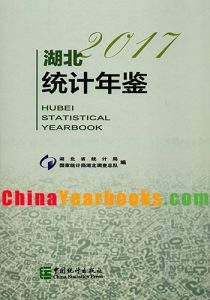 Ⅲ.In 2017 statistical yearbook of Hubei,discourse structure and “China Statisti-cal Yearbook” remain the same,with reference to the implementation of the “provincialstatistics index system directory”.The statistic of yearbook adopted the lastest standardand diameter range.And the English version and the interpretation of indicators wererevised thoroughy.In 2017,Hubei statistical yearbook added the main indicators of theYangtze River economic belt,and cut the individual indicator of the country economy. Ⅳ.The Yearbook of the past published statistical data to examine every and the al-manac data discrepancies,refer to this yearbook prevail.The Yearbook of statistics datafor the initial count,if the Yearbook text data are not consistent,please refer to the textdata is accurate. Ⅴ.In the annals of indicators are used to combine the interpretation of indicators,as well as annotations and reasonable use,so as to avoid mistakes. Ⅵ.Statistical Yearbook of Hubei published since,by domestic and foreign readersto care and support,the Yearbook content and editorial work put forward a lot of valu-able advice,for this,we express our gratitude.Because the level is limited,in the edit-ing work of unavoidable errors,we welcome suggestions and criticisms. I. Wuhan Statistical Yearbook一2017 is an annual statistical publication with dense information. It comprehensively and systematically reflects the achievements of Wuhan economic，technological and social development in 2016 making use of a large number of statistical data. it. In addittion，Explanatory Notes on Main Statistical Indicators are provided at the end of each section. 111 .Most of the statistical data in this yearbook is based on all kinds of 2016’s reports. The statistical data of main historic years since 1949 for some key indicators are listed in it. Some of the data are from sample survey. IV .According to the up一to一data statistical information and the newnational stipulation conncerned，some data in this yearbook has been revised after verifying a number of important statistical data released in the past. Therefore，readers should use data in this yearbook in case that it is not in accord with this yearbook. V. The notes concerning the whole table are placed at the upper part of the book，while the notes concerning the individual indicators are at the bottom of the table. VI .The units of measurement used in this book are international standard measurement ones. VII. Notations used in this book:“一”indicates no data in the item，“…”indiGates that the figures are not large enough to be measured with the smallest unit in the table，the blank indicates that the data aren’t available，“#”indicates the major items in the tabel.“*”indicates“see the footnotes below”. VIA .The calculating errors of some data in this yearbook caused by the unit conversion aren’t adjusted mechanically. Hebei Economic Yearbook 2014 is the twenty-seventh volume since it was published, which records the achievements and history of the economic and social development, reforms and opening to the outside world of Hebei province in 2013.